After the Greeks came marching into Judea (first Alexander the Great; later the Seleucid Empire), the Jewish urban intellectuals of Jerusalem found Greek thought very attractive and were, more and more, assimilating into the high secular Hellenic culture, abandoning Jewish tradition. Meanwhile, the traditionalists in the countryside – the country hicks from the small villages around Jerusalem – were having none of it. They didn’t buy that city-slicker sophistication. They had work to do, farms to run, no time for reading Plato or attending Greek drama, and no use for that new Greek gymnasium that had gone up. They had their own literary tradtions and didn’t want them cast aside or overshadowed. When the Hellenizers began to get their people appointed into positions as high priests over the Temple, the traditionalists fought back. Seleucid Emperor Antiochus IV, wanting to end the civil war, took the side of the Hellenizers. In doing so, he abandoned the usual Seleucid practice of not interfering with the local religions. The standard approach of the Seleucid empire, over its vast range encompassing a great diversity of local customs and rites, like many empires, was: we’re going to take our tribute of taxes, we’re going to conscript some of your young men for the Imperial army, but you can keep your religion and your culture. In Judea, however, Antiochus faced a situation in which his subjugated people were fighting against each other. To bring peace to the region, he entered the conflict, put the Imperial might behind the Hellenizers – the natural choice for a Hellenic overlord – and sought to quash the Hebrew traditionalists. To do this, he banned the traditional practices of Judaism, persecuted any Jew who maintained the observances, and required the people to follow Greek religious practices, including worshiping Zeus, which meant bowing to a statue. 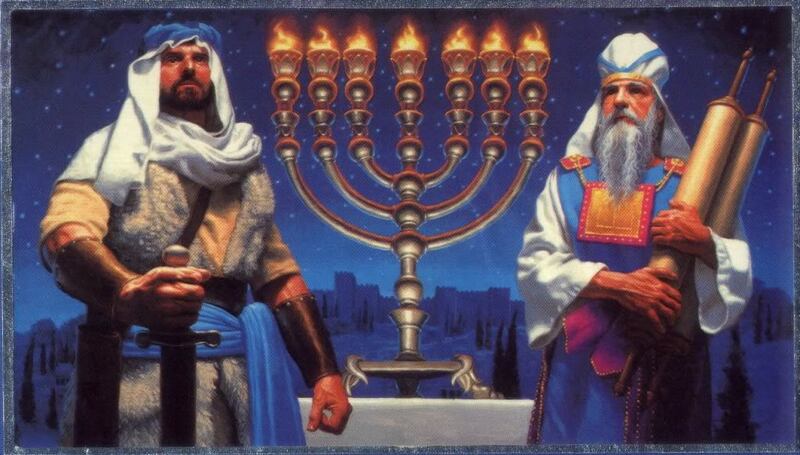 The Hanukkah story comes to us through the Books of First Maccabees and Second Maccabees. These books say Antiochus was simply wicked. They don’t mention that persecuting the local religions was a total departure from the Seleucid practice in all other places, and they downplay the civil conflict between Jews. You may be asking: are the books of First and Second Maccabees in the Bible? If you’re Catholic or Eastern Orthodox, the answer is yes. If you’re Jewish or Protestant, the answer is no. 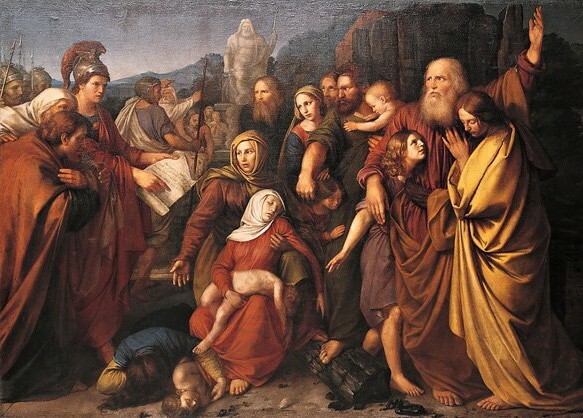 First and Second Maccabees are included in the Catholic Bible (in the Catholic "Old Testament"), and likewise in the Eastern Orthodox "Old Testament." Since the Maccabees books were not written until the first or second century of the Common Era, that means some parts of the "Old Testament" are newer than the "New Testament" (though they describe events that occurred before the Common Era.) While most of the books that Christians call the “Old Testament” come from the Hebrew Bible (the Tanakh), the books of Maccabees do not. For that reason, Martin Luther removed the books of Maccabees and a handful of other material, and created a Protestant "Old Testament" that includes only the books that are in the Tanakh. This may seem curious to nonJews: First and Second Maccabees are not part of the Hebrew Bible. In fact, there is no reference to, or basis for, Hanukkah in the Hebrew Scripture at all. It’s not in the Torah or any other part of the Tanakh. 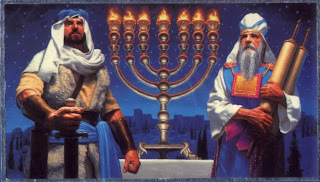 The whole story that Hanukkah is based on comes entirely from this extra-scriptural “people’s history,” the books of Maccabees. This is part 2 of 4 of "Rededicating the Temple"
Next: Part 3: "Free the Hanukkah Eight"
Beginning: Part 1: "The Empire Strikes Back...with Plato and Euclid"